Can ex-Amish return to the church? What is the Bann? Being in the Bann is how the Amish describe being excommunicated from the church. The Bann may be temporary or permanent (to the extent that it lasts until the excommunicated member reconciles with the church). What is shunning? Shunning, or Meidung in Amish parlance, refers to the practice of social exclusion and discipline. Shunning happens following excommunication of a church member for thwarting church regulations or other transgressions. Amish base this practice upon numerous passages from Scripture, including 2 Thessalonians 3:14 (“And if any man obey not our word by this epistle, note that man, and have no company with him, that he may be ashamed”). Shunning is intended to encourage the excommunicated to return to the church. In practice this means a change in social behavior towards the individual in the Bann (in other words, an excommunicated member). Amish can still speak with and offer aid to a member in the Bann, but do not accept any form of assistance, nor eat together in certain situations, nor conduct business with the excommunicated member. Shunning is meant to be implemented as a final resort after other entreaties have failed. It is performed as a reminder of the altered relationship due to the transgression, and is intended to encourage an errant member to change behavior and return to the fold. What is the Ordnung? Mutually agreed-upon church rules and guidelines for daily living, the Ordnung covers sanctioned and disallowed technologies, style of dress, and other matters. The Ordnung varies across churches and communities, sometimes significantly. It is reviewed and reaffirmed by each individual congregation twice yearly during the Council meeting which precedes Communion. Why and how are Amish excommunicated? Church members may be excommunicated, or placed in the Bann, for exhibiting sinful behavior, owning, using, and refusing to stop using forbidden technology, or other violations of the Ordnung (the communally-agreed church rules and guidelines for daily living). Excommunication usually happens as a last resort, after other methods of convincing a member to change his or her ways have failed. There must be a unanimous vote from the congregation for an individual to be excommunicated. Why do the Amish practice shunning? Amish derive this practice from their close adherence to principles laid out in the Bible. Amish feel that shunning helps preserve the integrity of the church and protects faithful members from “bad sheep” who might disrupt unity and lead others away from their commitment. Read more on why the Amish shun. Who decides whether someone should be excommunicated and shunned? Is it the bishop? Excommunication and shunning are decided via a vote of the congregation. The vote to excommunicate must be unanimous. It should not be a unilateral decision, though of course the bishop and other leaders can wield an influence. The bishop has the power to raise the issue of Ordnung violations and excommunication for the congregation to vote upon. Excommunication is usually seen as a step of last resort, after personal meetings with leadership and other church members have borne no fruit. In dysfunctional churches it may be invoked for the wrong reasons, including personal motives. Who can be shunned? Shunning only applies to baptized church members. Though the term is sometimes used loosely, it does not apply to unbaptized members or non-Amish people. Are there different types of shunning? Yes. In fact there is a division between churches who practice streng Meidung (strong or strict shunning) versus those who follow a milder approach to shunning. Adherents of streng Meidung maintain the Bann until an errant member confesses and returns to the Amish church (his home church). Swiss Amish are among those who practice Streng Meidung (strong shunning). Adams County, Indiana. 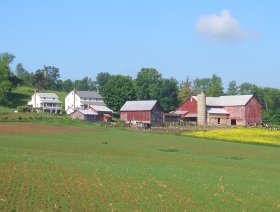 Milder forms of shunning allow the Bann to be removed when the individual joins any other Amish church, or even a non-Amish church with Anabaptist roots and beliefs (often a more progressive Mennonite church). Adherents of strict shunning include Swiss Amish, Lancaster County Amish and their sister communities, and Swartzentruber Amish. Can excommunicated Amish return to the church? Yes. Though this happens infrequently, if a member shows a contrite heart and makes amends, he or she can and will be welcomed back into the church. One Amishman says that when an errant member returns, “The parable of the lost sheep in Matt 18 is very descriptive. Many tears are shed and there is a feeling of restoration.” There have even been examples when an excommunicated person returned to the Amish church in advanced age, after many years in the Bann. 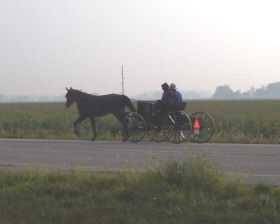 Are the Amish the only religious group that practices shunning? No. Some Mennonite groups as well as Jehovah’s Witnesses are among the religious groups which practice forms of shunning, though the specific form it takes may vary. Isn’t shunning cruel? Shunning is sometimes depicted as cold and cruel. No doubt, if it is unjustly practiced, it can be those things. Especially if applied in a heavy-handed manner and without a sense of love and concern for the individual, shunning can create great pain and alienation for the excommunicated person. As imperfect humans are involved, the practice does not always meet the ideal or intention. However it is also an understood and widely-accepted part of Amish life. When someone chooses to be baptized into the church, he or she is aware that their baptismal commitment means accepting the Ordnung and the consequences that entail if it is broken. While some may disagree with the practice, Amish see a Scriptural basis for excommunication and shunning. Read more on shunning among the Amish. “Do Jehovah’s Witnesses Shun Former Members of Their Religion?” JW.org. Watch Tower Bible and Tract Society of Pennsylvania, n.d. Web. Accessed 23 Apr. 2015 (page update). <http://www.jw.org/en/jehovahs-witnesses/faq/shunning/>. To Cite this Page: Wesner, Erik J. 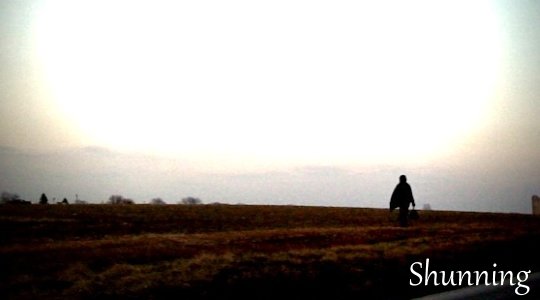 “Shunning.” Amish America. Erik Wesner, 10 Apr. 2015. Web. [Date Accessed]. <http://amishamerica.com/shunning/>. Erik.. I know this is an older piece but I wanted to share my experience with shunning. I know the practice of shunning differs from each church even going as far as from families within the same church district. Although I have never been Amish, my husband’s family who are still Amish treat me as if I was under the bann. They will longer drive with me or except anything from me (other then handmade things such as crochet..ODD) or even eat with me. Some won’t look at me, acknowledge me or even speak english when I’m around. Although some will take things from my hand and hand me back things. I’m sure this isn’t the “norm” for most but I wanted to share my experience with you! Thanks for sharing that Beckysue. I have heard of something similar happening in a stricter community. I’m sorry to hear that sort of thing happens, sounds pretty harsh. why ask the ovious …..
looking for info on my Grandmother my Grandpa had her Bann from the family wnen children were young does anyone have info please ?